This was the 'late start' day, but only because of the additional logistic of having to get the bus from Chamonix to Courmayeur via the Mont Blanc tunnel. That left at 7am and dropped us into the picturesque town of Courmayeur on the 'sunny side of Mont Blanc' (as they were very keen to emphasise!) 45 minutes later. However, we realised we may need to carry cash so a scurry around the village (hey, it was an excuse to see the place before we left also!) 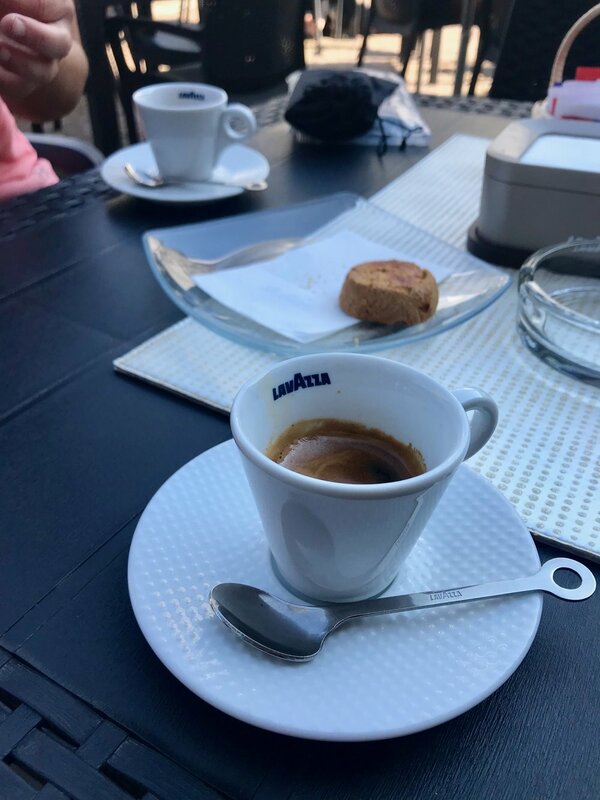 and the required-by-law (o.k., not really, but it should be in Italy) espresso to jump-start our walking and running legs. Straight off, it's a nice steady grade. For about a kilometre! Then, the climb accelerates steadily out of Courmayeur climbing from roughly 1,250metres to ~2,000metres in four kilometres, to arrive at the Bertone Hut and a jaw-dropping view of Chamonix (below). Seriously. Wow! After that you follow the balcony route traversing north before you reave the Bonatti Hut (reports on the hut are the obviously amazing views if you stay there at night, but the food is appalling). For us, this was 12KM into our day so it was a case of enjoy the view over a half hour lunch, then get moving once again. That happy and blissfully ignorant look that we still had another 90km to go! Mont Blanc peaking out of the clouds in the top left. Arriving in at 18:50, and well 'worn' after several hours on the hill in blazing sunshine we were informed that the dinner was served at 7pm! A quick splash of water to skin, throwing on our 'evening' clothes (which also doubled as our cold weather gear on the hills), many apologies to our shared table about our possible look and dishevelment, we joined the other hikers on the tour for a lovely evening of chats, surrounded by Danish, Americans, British, Israelis and various other nationalities. Sharing our dorm with an Israeli family turned out to be highly entertaining, allowing me the opportunity to share stories of my own 6-month experience of living in their beautiful country. After that, off to bed and a warm stuffy night in our dorm room before our second day began! The final climb out of the valley departing Italy. As for energy levels and mood, while showing some fatigue from Naomi on the final climb and my problematic knee (caused before our trip) holding up relatively well on the descents, our mood was great form overall with lots of banter. Would this continue for the three planned days of back to back running? Roll on Day 2! 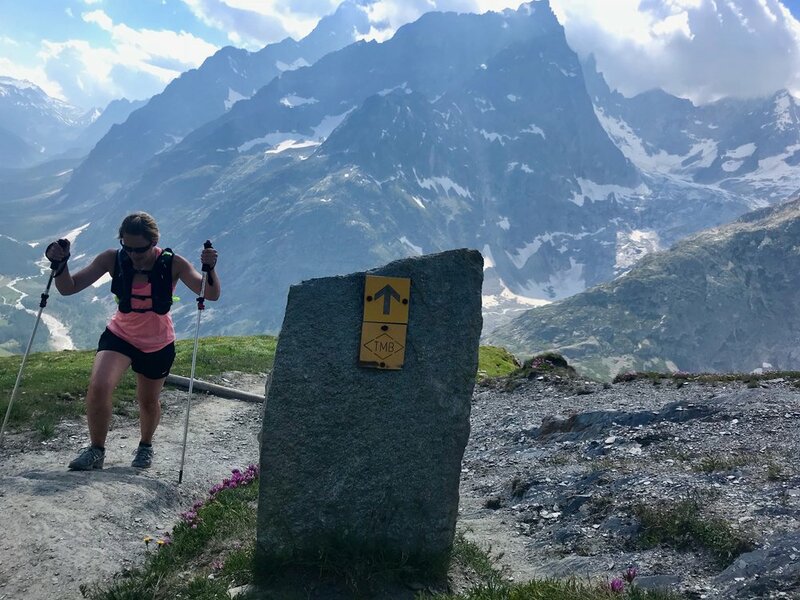 UTMB route: After the final ascent and on the descent to La Fouly, and just before the Chalet de la Peule, the UTMB takes a left and cuts across the ridge. Presumably this is to avoid the road running of the TMB route. As it's not marked, and to save any confusion over which trail it actually was, we made the decision to stick with the TMB route. The only supermarket we saw from Courmayeur to Chamonix were in La Fouly and Champex. Worth keeping note of if you're planning to stock up on bars/snacks on your own adventure. Looking for Day 2 - try here!